Apple's one-day shopping event is now live in Australia and New Zealand, offering customers free Apple Store gift cards worth up to A$200 or NZ$215 with the purchase of selected Apple products today only. 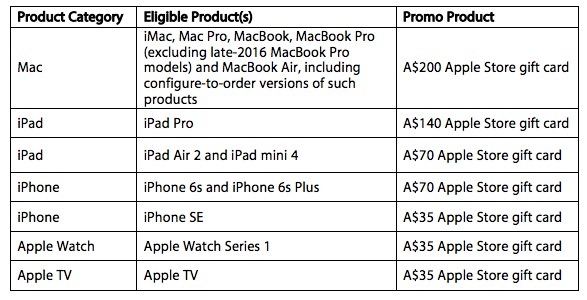 The offers are available through Apple's website in both countries and at Apple retail store locations in Australia. Each customer is limited to two gift cards per product category. Refurbished products do not qualify. In Australia, Apple is offering a $35 gift card with the purchase of an iPhone SE, or a $70 gift card with the purchase of an iPhone 6s or iPhone 6s Plus, at full retail price. iPhone 7 and iPhone 7 Plus models do not appear to qualify. 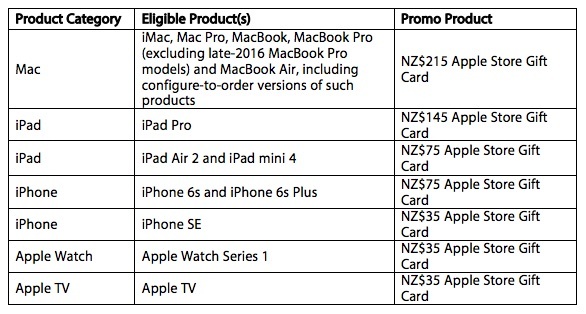 Australian customers can also get a $140 gift card with the purchase of an iPad Pro, $70 gift card with the purchase of an iPad Air 2 or iPad mini 4, and a $35 gift card with the purchase of an Apple Watch Series 1 model or fourth-generation Apple TV. Apple will be hosting similar one-day shopping events in the United States, Austria, Belgium, Canada, Czech Republic, Denmark, Finland, France, Germany, Hungary, Ireland, Italy, Luxembourg, the Netherlands, Norway, Poland, Portugal, Spain, Sweden, Switzerland, UAE, the United Kingdom, and elsewhere on Friday. so, all old stuff? thats sad! So you only get a gift card if you buy old products? No thanks. Not much of a deal if you're not getting a discount up front, is it? Looks like a sign of things to come. Wish they'd just bite the bullet and discount those horrible prices. Hey, with that $200 gift card people can now afford that asinine coffee table book. Score! Where are you seeing the deals on the UK site chaps? I wouldn't bother though, get £120 gift card with a MacBook that was £250 cheaper 2 months ago! This doesn't seem to make sense. So you're being rewarded for buying older hardware, but nothing is given for spending more money on the latest hardware?